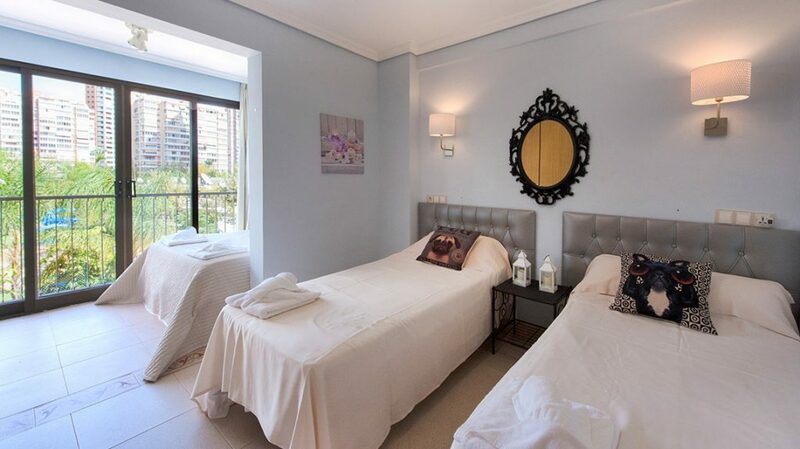 These comfortable two-bedroom Levante Beach apartments are ideally located close to the beach and offer beautiful views through the large glass doors and windows – especially spectacular at night when the city’s famous skyscrapers light up. 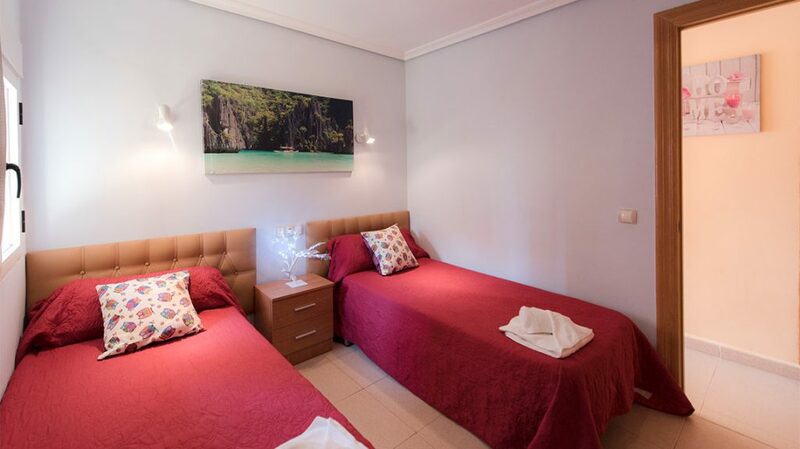 Suitable for a maximum of five guests, the apartment offers two bedrooms with a selection of comfortable beds. One bedroom has been provided with two beds, while the other bedroom features two beds with a third in an alcove off the main room. 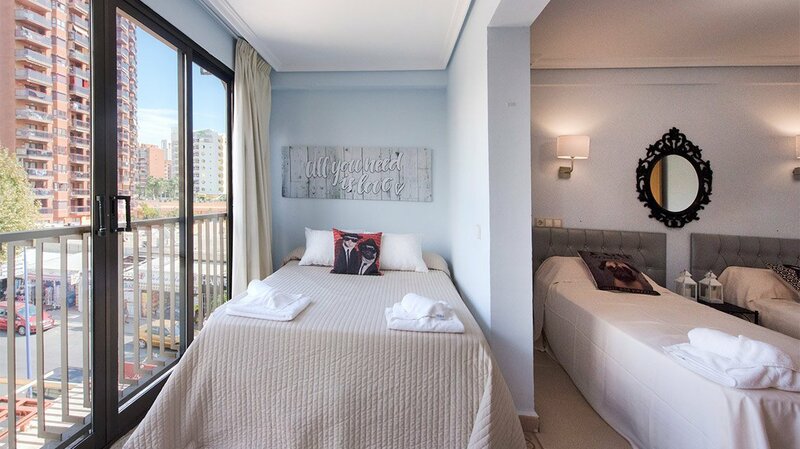 The room with three beds offers a spectacular view over the city from its closed balcony. Bed linens will be provided for all the beds – no need to lug sheets or duvets around when staying here. The apartment’s air conditioning ensures comfort, while a flat screen television with satellite is the perfect distraction for the rare rainy day. The apartment is also equipped with Hi-fi equipment to provide music for entertaining during, for example, hen party or parties. The décor is sleek and modern, featuring smooth pastels highlighted with white, with a number of charming murals and artistic touches that give the apartments a homey, welcoming feeling, while still maintain a sense of modernity, a certain sleekness of line and form that invites comfort. 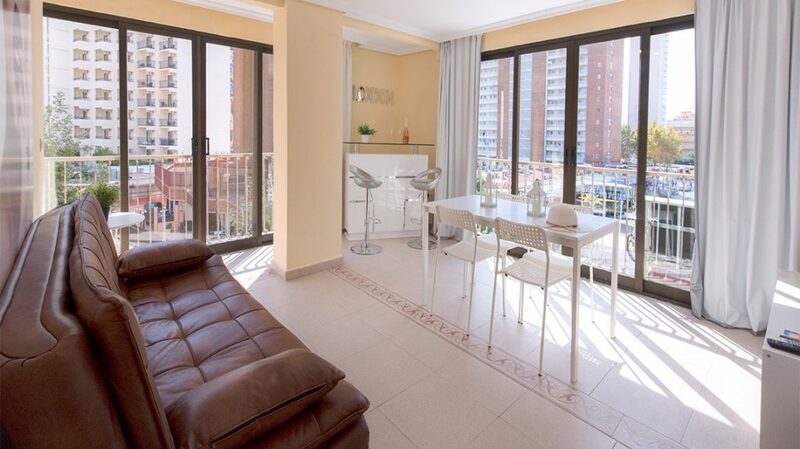 These Benidorm apartments feature a compact dining area, as well as a small bar against one wall in the living room, and ample seating for guests and visitors. 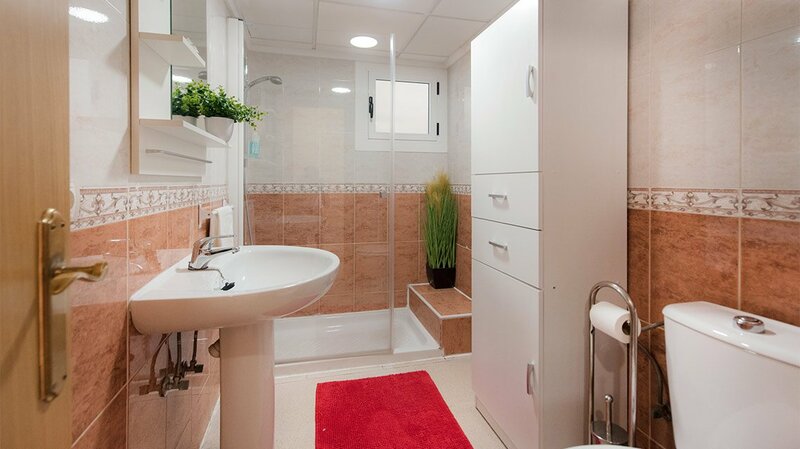 The spacious bathroom features elegant ceramic fittings and a large glass shower, as well as a storage unit for the provided towels, linens, and other products, decorated in white and earthy browns. 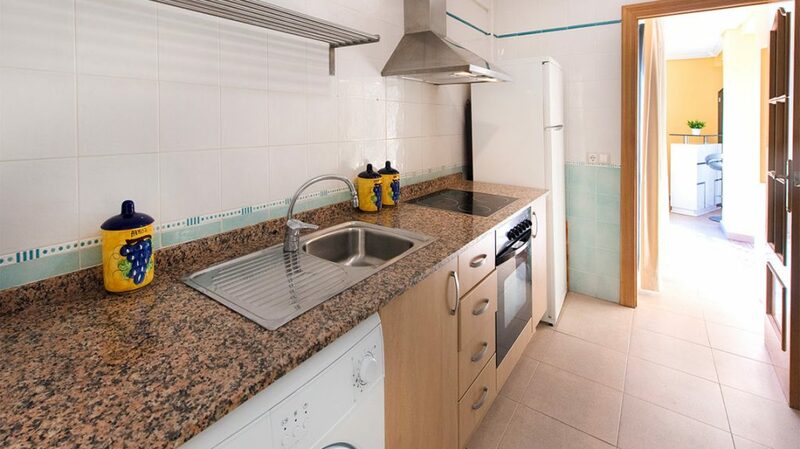 The fully-equipped modern kitchen is also charming, leading off the dining area into a long room where guests will find that all modern conveniences have been provided, including a coffee machine and a kettle. The large sliding glass doors in the lounge area are perfect for catching a passing breeze and offer a stunning view of the city and the sea. There are sliding glass walls in two of the lounge area walls, providing unmatched views.